Halloween Pumpkin Escape info about the game-Games2Rule. 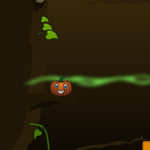 Halloween pumpkin escape is new type of point and click escape game created by GAMES2RULE.COM In this escape game Halloween pumpkin unfortunately fallen into a big hole. There is no one near to help the pumpkin. So help the Halloween pumpkin to escape from the big hole by using some objects from there. You can escape step by step only. So don't miss the objects to collect before you go to further step otherwise you have to fall again into the previous step and collect the objects then play the same steps again. Finally the rescued pumpkin will goes to celebrate the 2012 happy Halloween festival.